San Diego Pond Service is North County's choice for experienced, dependable, friendly pond service and koi fish care! For clean, healthy, beautiful koi ponds, our pond maintenance is second to none! San Diego Pond Service maintains koi ponds and water gardens all over San Diego county. From Rancho Santa Fe ponds, to Carlsbad ponds, to La Jolla ponds, to Del Mar ponds, to Encinitas ponds, to Cardiff ponde, to Point Loma, to Old Town ponds, we are proud to serve the greater San Diego area! 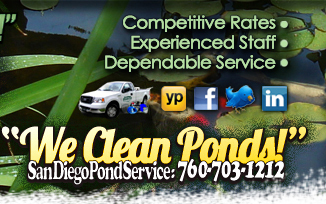 San Diego Pond Service is North County's pond owners "go to" pond cleaning and pond maintenance service company. We are pond service professionals and are passionate about clean, healthy koi fish ponds. Let San Diego Pond Service care for your koi pond, wwater garden, or fountain! Keep your pond beautiful! Dirty pond? San Diego Pond Service is the answer for clearer, cleaner pond water, pond muck removal, aquatic plant management, pond algae control, pond management, koi fish and underwater environment care, and pond filter system maintenance. Contact San DIego Pond Service today! Ranho Santa Fe ponds love San Diego Pond Service and Pond Maintenance! BOG PLANTS: Bog plants are referred to as "marginal plants." These plants are typically found on the edges of your pond, grow in shallow areas, prefer wet sloppy mudsoil, and can add a lot of aesthetic beauty to the pond. Types of bog plants include: Arrowhead Sagetteria, Canna, Cattail, Four Leaf Clover, Fiber Optic, Floating Hearts, Forget Me Knot, Golden Flag, Iris, Papyrus, Pickeral, Red Ruby Runner, Rush, Taro, Umbrella Palm, Water Celery, and Water Hibiscus. Bog plants are excellent filtering plants. Thrives during warmer temps and blooms all summer long. Hardy plant that grows 2-3 feet tall. Goes dormant during cold winter months. Cannas are a great addition to your pond. They grow 6’ tall, so they look best in larger ponds. Beautiful yellow or orange blooms. Thrive in summer. Cattail grow rapidly in warmer summer temps. Unless they are tended to, they can quickly grow out of hand and have an evasive root system. Clover looks great when it fills in. Grows 3”-6” tall in shallow water. Hardy, slightly evasive pond plant that thrives year round. Does not flower. Fiber Optics look great in waterfalls, header ponds, or pond comers or cracks. All season plant that can grow a few feet in diameter. Blooms small white flowers at tips of leaves. Miniature water lillies, Leaves are about 2” in diameter. Blooms small, soft yellow flowers during warmer summer months. One of our favorites. This little plant looks beautiful on waterfall ledges or in streams. Grows best in very shallow water and warmer temps. Non-evasive with small pretty flowers. Similar to Fiber Optic, yet not as hardy. Yellow in color with thicker, flatter leaves, that grow best during peak summer months. Nice filler plant. Very hardy, blooms yellow, lavender, or purple flowers during spring. Great background plant. Grows quick, needs lots of maintenance. Add some diversity to your pond with the addition of Papyrus. Struggles in colder temps. Available in 3’ dwarf or 6’-8’ giant sizes. Great edge plant. Lush and brilliant green with beautiful purple flowers. Hardy plant that blooms in spring and summer. Vibrant purple plant that has a bush-like appearance. Adds good color diversity to the pond. Great in pond waterfalls. Grows to it’s surroundings. Struggles in colder temps. Unique plant that has twisting, spiraling leaves. Some pond owners really like it, some thinks it looks ratty. Hardy, all-season plant. Hardiest of the taro family. Thrives in summer growing up 6’ tall. This plant can be evasive and grows outside of the pond. Breathtaking taro plant that needs warmth and moderate sun. Adds a lot to your pond. Grows up to 3’ and struggles during winter. Not as fast of a grower, but once full, it looks real nice as a backdrop to your pond. Adds a lot of depth with it’s dark stems and bright yellow flowers. Grows up to 6’ tall. Our favorite of the taro family. Imperial taro has rich colors. Deep purple on top of lime green, looks fantastic. Real slow grower, grows up to 3’ tall. Umbrella Palm looks great as a center piece or as a back drop. Hardy plant that survives colder winters. Nice, subtle plant that really adds a great look to the pond when mixed with other bog plants. Grows out to it’s surroundings. Rich lime color. Fast grower during summer. Requires tropical temperatures. May struggle in mild climates. Red flowers are rich and vibrant. Grows to over 3’ tall. POND PLANT MAINTENANCE: When adding plants to the pond, understand that there is required maintenance that goes with having a beautifully manicured pond. Large ponds with lots of plant decor, will require more pond maintenance. Knowing which plants to add to the pond and understanding where to put them, will greatly reduce the time spent pondscaping. 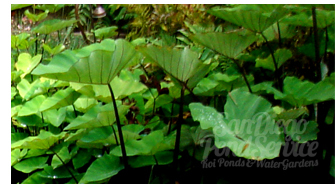 OTHER TYPES OF POND PLANTS: Pond plants such as lilies, lotus, bog plants, and various typs of floating plants, all look great in your pondscape. San Diego Pond Service can create custom pond plant decorations that will bring a lot of character and beauty to your pond! If your pond is new, old, large or small, San Diego Pond Service's pond technicians are trained in a variety of pond and koi care including routine pond maintenance, on-call pond service, pond clean-outs, complete filter system installs, pond water treatments, filter and UV system cleanings, pond sealing, koi medicating, koi and fish care, algae control, aquatic plant care and decor, and all other aspects of koi fish care and pond or small lake management. For ? 's, pricing info, or to schedule a pond consultation, call San Diego Pond Service @ 760-703-1212 and leave the dirty work to us!